David Elroy Goldweber was born in New York City and raised on Long Island. His parents were science fiction fans, and young David was fond of browsing through their piles of 1950s pulps. David's love for science fiction, horror, and fantasy goes back as far as he can remember. He attended college at Vassar, then graduate school at NYU. After earning a PhD in English, he moved to the San Francisco Bay Area where he has taught English classes ever since. He lives now in Oakland with his wife, son, and cat. Goldweber has published literary criticism, humor pieces, op-ed pieces, a series of film articles for Forces of Geek, a history of Star Trek for the St. James Encyclopedia of Popular Culture, and a guide to Fantasy Films of the 1980s. He wrote and revised Claws & Saucers over a 12-year period, 2003-2015. He watched one movie at a time, speaking into a hand-held tape recorder as he watched, playing back the tape afterwards to write the entries. "Thank you for browsing these excerpts, fellow film fans. 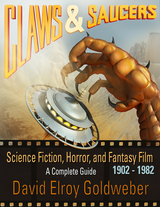 Claws & Saucers is your companion - not just for a few months or a few years of viewing, but for a lifetime."